You can not deny the importance of physical exercise to lead a healthy life. Try doing this exercise to stregthen your lower body. This exercise is an isolation exercise which isolates shoulder flexion. It primarily works the anterior deltoid, with assistance from the serratus anterior, biceps brachii and clavicular portions of the pectoralis major. 1. 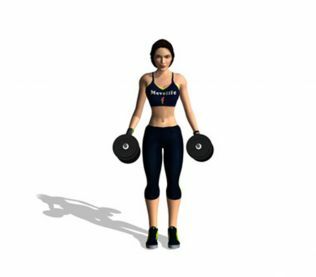 Stand with a straight torso and grab your dumbbells in front of your thighs. Now, lift the dumbbells to the front with a slight bend on the elbow and the palms of the hands always facing down. 2. Continue to go up until you arms are slightly above parallel to the floor. Then, lower the dumbbell back down slowly to the starting position.